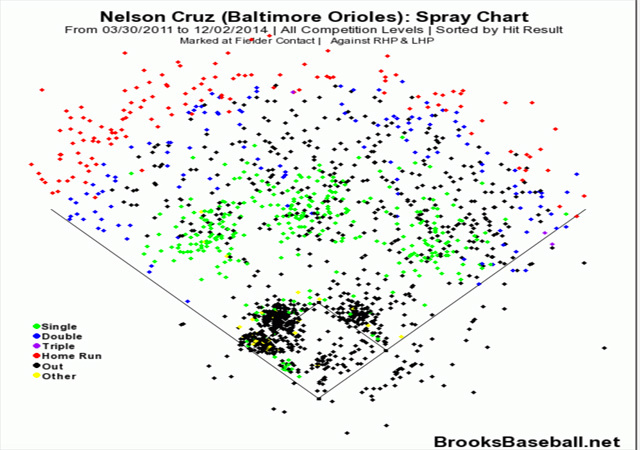 Will move to Seattle sap Nelson Cruz's power and fantasy value? MLB's home-run king in 2014 will likely see a dip in his power numbers with the Mariners. Is that enough to kill his value in fantasy leagues? One year after backing away from a one-year deal with Nelson Cruz that included a club option for $9 million for the 2015 season, the Mariners signed the slugger to a four-year, $57 million deal earlier this week. The Mariners have made no secret of their desire for righthanded pop, and that's exactly what they got in Cruz. But as he leaves Baltimore and cozy Camden Yards for Seattle and cavernous Safeco Field, just how much pop did the Mariners buy with their money? Let's start out by acknowledging that the ball is travels a little bit differently through the air in the Pacific Northwest than it does in the Mid-Atlantic region. I'm not a meteorologist, and neither are about 99.9 percent of you reading this. The ball generally flies farther in Baltimore than it does in Seattle. Let's leave it at that for this analysis. Cruz has always hit his fly balls far and hard. According to the invaluable Baseball Heat Maps, Cruz's average fly ball distance each season dating back to 2011 has been 300.66 feet, 289.72 feet, 306.06 feet and 296.97 feet. He's been outside the top 30 in the league only once, back in 2012. In 2011 and 2013, he was in the top 15. When Cruz sends a ball airborne, it generally travels far. That's good news regardless of what stadium you call home, and even better news when that home park is Safeco Field. Last month, Tony Blengino wrote a column on Fangraphs that specifically looked at the park factors for left-centerfield power alleys at all 30 MLB stadiums. It's an interesting read full of great information, but the takeaway for our purposes here is that no stadium depresses power to left-center greater than Safeco. According to Blengino's analysis, fly balls to left-center at Safeco produced a .167 batting average and .367 slugging percentage. The average MLB fly ball to left-center produced a .245 average and .600 slugging percentage. Taking hard-hit balls into account, the typical fly ball to left-center in Seattle was expected to produce a .250 average and .642 slugging percentage. In other words, Safeco's left-centerfield alley is where potential doubles and homers go to die. Cruz, however, is not a dead pull hitter, especially when he's driving the ball to the outfield. 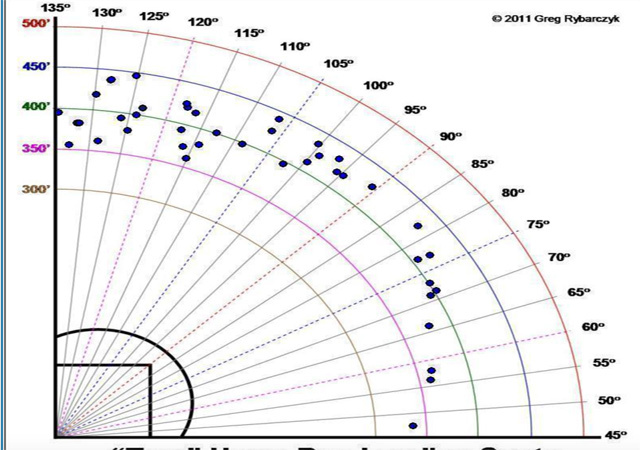 Below is a screenshot of Cruz's 2014 home-run spray chart from ESPN's hit tracker tool. As you can see, 10 of his 40 homers were to the right of straightaway centerfield, and another six were fewer than 10 degrees to the left of center. This wasn't a just a recent phenomenon, either. 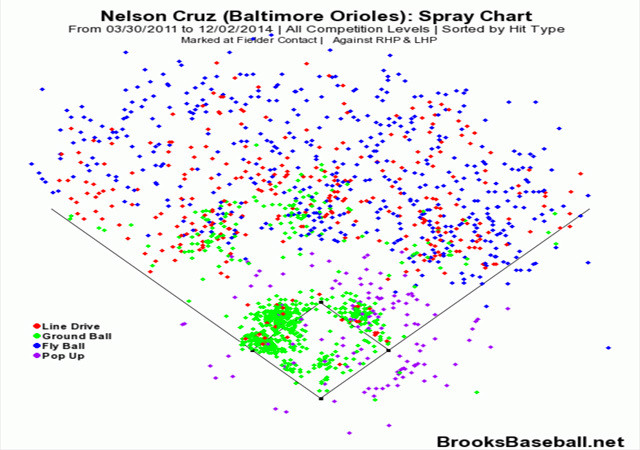 Below are two of Cruz's spray charts from 2011 to 2014, courtesy of Brooks Baseball. The first is hit results, with home runs in red. The second is hit types, with fly balls in blue. Both show how frequently Cruz lifts the ball to the opposite field. ​Cruz doesn't just hit the ball far and all over the outfield. He also hits the ball hard, and that's very important at Safeco Field. ESPN's hit tracker records the velocity off the bat for every home run hit in the majors. There were 140 homers hit at Safeco Field last year, and just three were hit to left-center with a velocity of less than 100 mph. Only eight of Cruz's 40 bombs last year came off the bat at less than 100 mph, and four of those eight were hit to rightfield. Translation: If Cruz hits a fly ball to the pull side of the field, he typically hits it hard. 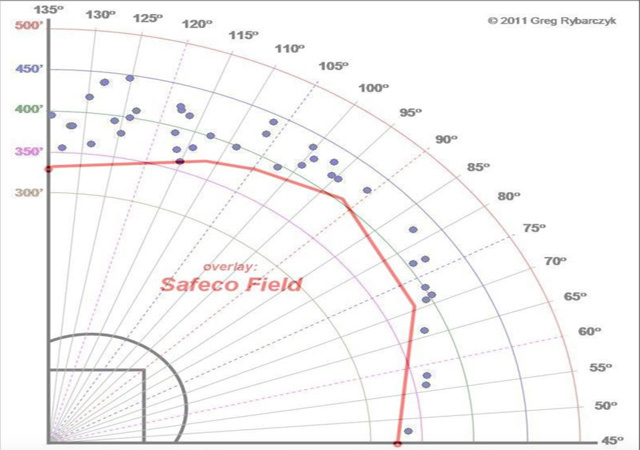 Below is one final screenshot, this one a chart of Cruz's true home run distance with an overlay of Safeco Field. Clearly, Cruz has enough pop to leave the yard at Safeco on a consistent basis. What's more, he hit .289/.346/.584 with 25 homers away from Camden Yards last year, so we know he can do plenty of damage at the 13 other parks in the American League. It's safe to say that Safeco is going to have a negative effect on Cruz's power, and a handful of balls that would have landed in the bullpen or the seats in Baltimore will find an outfielder's glove in Seattle. At the same time, this isn't Robinson Cano leaving Yankee Stadium for Safeco. Cruz remains a strong bet to hit 30 home runs next season.